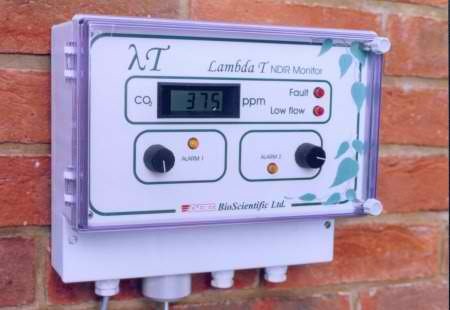 The Lambda T is a high accuracy CO2 monitor employing a novel twin wavelength, non-dispersive, infra-red, optical technique. This detection system ensures that the monitor is gas specific and maintains long-term calibration stability. The monitor is simple to install and can be online and measuring within minutes. The mains powered, wall mounted device is IP54 rated and so can be placed inside greenhouses or similar harsh environments. The system contains no costly consumables and maintenance is limited to filter replacement and an annual calibration check. The Lambda T has two, user-configurable alarm points which close independent voltage free relay contacts. These contacts can be used to turn on an elevated CO2 supply or operate ventilation.